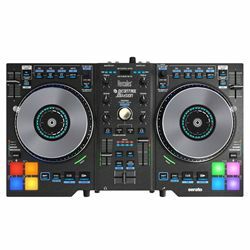 The Hercules DJControl Jogvision perfectly combines performance and ease of use. Whether you’re just getting started or you’ve already refined your skills, you can let your creativity run wild. Enjoy excellent precision and comfort to create your mixes using the circular displays on the jog wheels to guide your movements and perfect your scratches, and have fun with the amazing contactless AIR Control sensor. The included Serato DJ Lite software gives you instinctive control, along with tons of other features that you’ll love.